Defines the active Width (Wa) of the VideoFrame (in VideoSamples). Defines the active Height (Ha) of the VideoFrame (in VideoLines). Defines the VideoFrame Rate (in Hz). Defines the Aspect Ratio of the VideoFrame (in 16.16 notation). Defines the total Width (Wt) of the VideoFrame (in VideoSamples). Defines the total Height (Ht) of the VideoFrame (in VideoLines). Placeholder for additional VideoFrame related parameters. 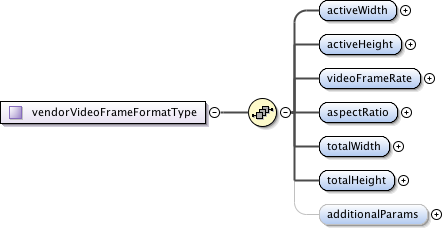 Describes a vendor-defined VideoFrame format used.